Typhoon Kalmaegi hit Hong Kong and a Typhoon 8 signal went up. This meant wind speeds up to 159kmh, heavy rain that caused floods and landslides, as well as shutting down schools and businesses. 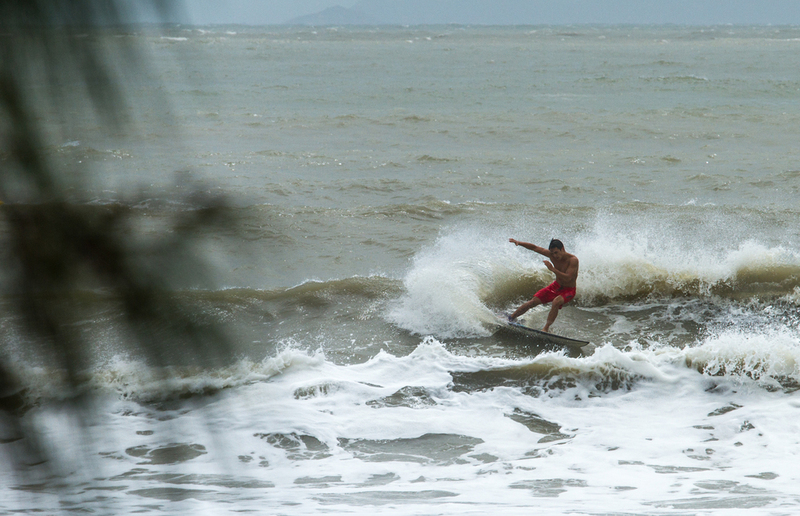 With these high winds also comes a big swell and Hong Kong’s surfers took full advantage of the situation since the summer seas are normally flat. 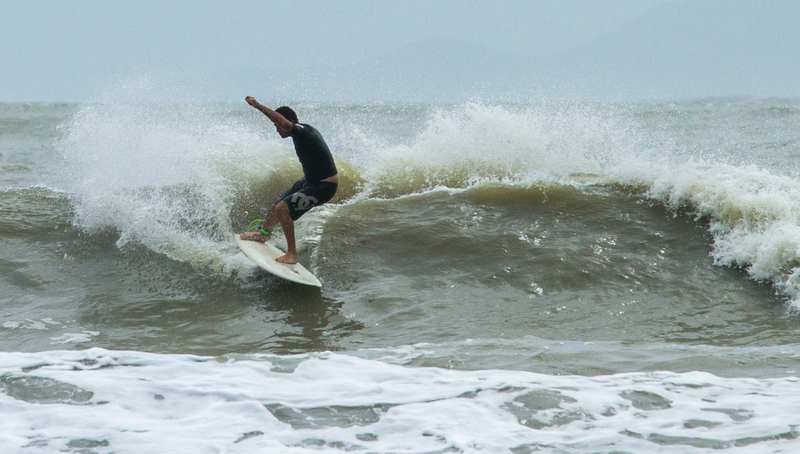 So when a swell arrives you can guarantee Hong Kong surfers will be frothing at the mouth for what is in store. 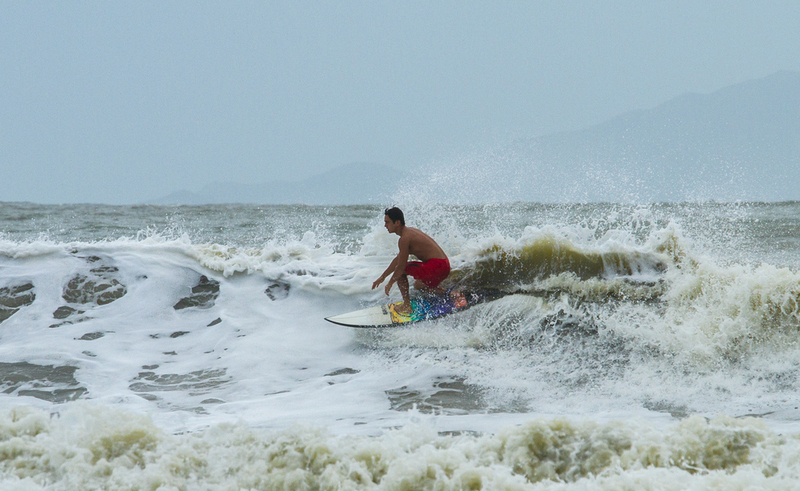 Typhoon Kalmaegi is the only second typhoon I’ve surfed in and a first for one on Lantau Island, where during a summer typhoon the beaches get better wind and swell direction than during the winter months. Two years ago it was Shek O beach on Hong Kong Island that I surfed during a rather weak T8. At 5:30 a.m. I woke up, packed and ready from the night before and had a quick breakfast to fuel up. In reality though, I never went to sleep as I was too excited and throughout the night all the doors and windows in my flat were rattling and whistling at me, the wind outside was so strong I could barely hear myself think. At 6:30 a.m. I set off in the car, picking up my friend Bryant, who like me was suffering from a lack of sleep, and headed for Lantau Island, the roads empty of other vehicles but full of debris from trees, garbage, and other loose items. Stoke was high. 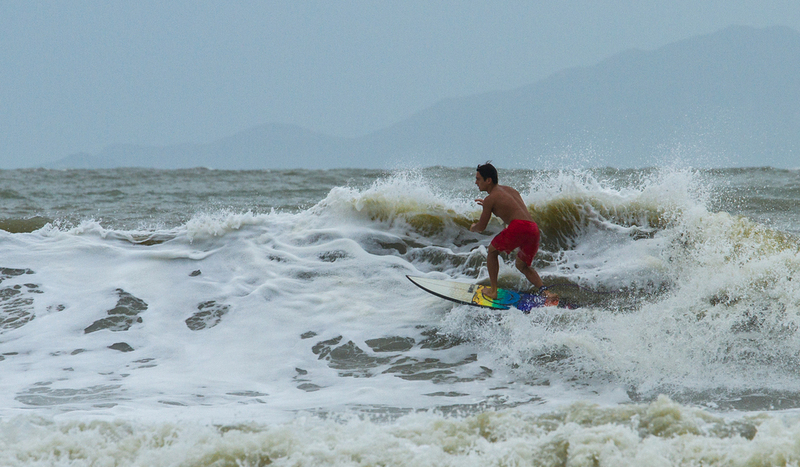 When we arrived at Poi O beach, Lantau it was raining, the winds were still howling but the waves were only medium sized. Compared to the harbor during a typhoon where water is being churned around in such a small area having nowhere really to go, Poi O beach is much more open so you don’t get the same washing machine effect. Water has more room to move around and so the seas are calm (apart from the perfect sets of waves making their way towards you). The first hour in the water was tough, paddling into waves blind, as rain pelted you in the face. However, after only an hour, the winds subsided, the water calmed, but the waves were building. By 10:00 a.m. we were surfing clean overhead-sized waves all the way to the beach. It was so awesome and you could see the enjoyment on everybody faces. 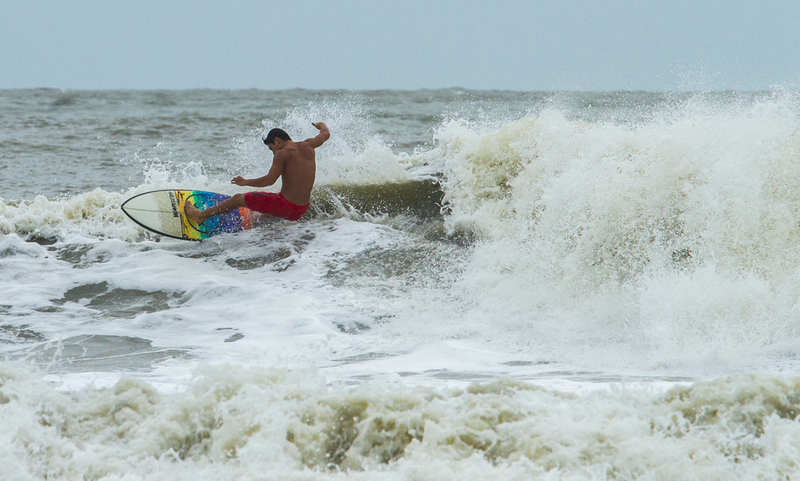 This lasted until about 12:00 p.m., when the swell started to die down. At this point, after almost 4 hours in the water, I was shattered, so I decided to get the camera out and take some snaps. I really should have done it earlier as the pics I got really don't do justice to the morning waves. Luckily Alec, who we met down on the beach, is a great surfer, so he made these little waves look a ton of fun. 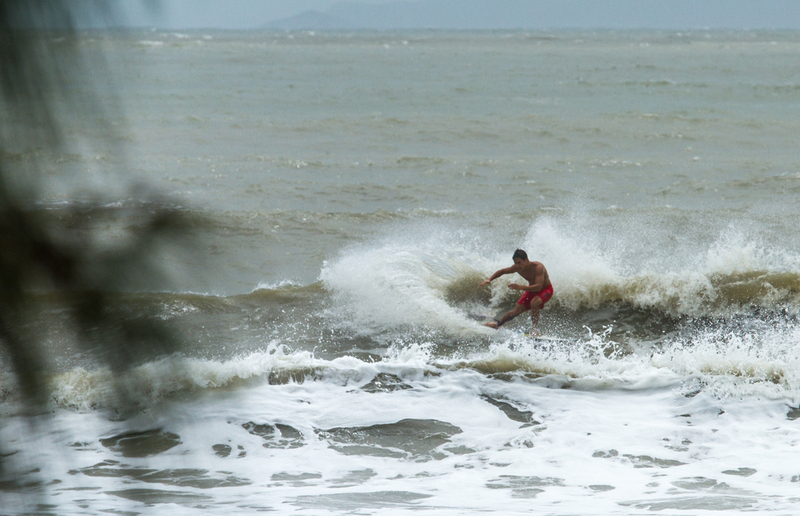 While people think we’re crazy to surf during a typhoon, it really isn't as mad as most people think. Waves in places like Bali, Australia, and Hawaii are twice, three times, or more the size of our typhoon waves, but because that’s the norm there and it’s nice and sunny, nobody thinks twice about it. Surfing in a typhoon isn't crazy but you should certainly take into consideration your own abilities and not paddle out if you are in doubt. The waves are still big enough that you can take a beating or two and that’s never fun but when you catch that bomb of a wave it’s totally worth it!